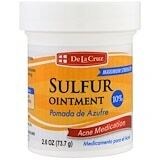 De La Cruz Sulfur Ointment is a maximum strength acne treatment. It penetrates the pores and dries and clears pimples and blackheads. In addition, it helps to keep new pimples and blackheads from forming. This effective ointment has been allergy tested and does not contain fragrance, parabens or artificial colors.